One of the most exciting (and frustrating) parts of being a marketer today is that platforms are constantly evolving and our strategies have to evolve with them. Today we’re joined by Susan Wenograd, Account Group Director at Aimclear, who brings her insights on the changes that are coming in 2019 and how ecommerce business owners and marketers need to start thinking differently about their paid social strategies. Susan talks about how paid media is moving from a direct response channel to an integrated one, the impact this has as content and budgets are split into increasingly smaller parts, what to do when you start seeing a decreasing ROAS on Facebook, and the role brand awareness plays in all of this. If you’re investing in paid media, you will not want to miss this episode. Enjoy! 8:50 How the marketing landscape changed in 2018, especially with paid social, and what ecommerce business owners and marketers need to be aware of moving into 2019. 11:34 As paid media becomes more of an integrated channel rather than direct ROAS, you’re going to have to think differently about your messaging. 12:55 The consequences of creating snack-sized content has on your messaging and your ad spend. 15:58 What sets great agencies and practitioners apart, and what to look for if you’re hiring. 17:54 Multi-touch attribution: what it is and how to start measuring it. 21:58 Common multi-touch models and their upsides and downsides. 24:17 The cross-channel trick to increase the click-through-rate of Facebook ads. 26:04 How to adjust your cross-channel SEM tactics depending on your budget. 28:08 Why it’s important to integrate a brand awareness strategy into your funnel and where to do it. 34:24 The types of interactions Susan sees on ads with general brand messaging vs. on ads that are pushing a sale. 36:07 Susan’s tips for managing your marketing spend this year, and your expectations. 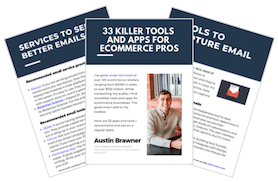 40:51 Where content marketing fits for ecommerce businesses. Austin Brawner: What's up everybody? Welcome to another episode of the E-commerce Influence Podcast. My name's Austin Brawner. Andrew Foxwell: I'm Andrew Foxwell. Welcome to the show, man. It's good to chat with you. Austin Brawner: Good to chat with you as well. I'm feeling quite refreshed today. Got back from a weekend out in the Hill Country; went out to a cabin with my wife, spent Friday and Saturday just kind of like completely disconnected ... airplane mode. I don't even think there was a service there, which was nice. Did some star gazing, spent most of the day outside, came back on Sunday feeling so good. Andrew Foxwell: Huge, huge. I will say that for me, I had a nice weekend as well. It wasn't as unplugged, but using screen time on my phone has been incredible for my mental health. For example, now I only allow myself 40 minutes of social networking a day, which sounds like a lot to people, but when you're on Twitter looking at things, on Instagram looking at things, and I use Facebook professionally on my phone; that's really helped my mental status lately. That's been pretty huge. Now, if I need to go on to look at what somebody says in a group or something on Facebook, I can just go to my desktop and it's more intentional versus passively consuming it. That's been big thanks to James Clear from the Atomic Habits book that kind of helped give me that little tip. Austin Brawner: I think that's great, just being intentional on ... I mean, both of us are on, in front of screens for most of the day, just because of work. Most of our listeners are going to be in the same boat, but having that intentionality and choosing to be in front versus just passively being there, it's such a huge difference. Andrew Foxwell: Totally, totally. I'm excited for today, man, to have Susan on the show. Susan's a friend of mine, in the Facebook ad world, paid media world, contributor to Marketing Land, a social media examiner, a whole bunch of different places, and has a very good reputation. She's the account director now for Aimclear and shares a lot of interesting thoughts on attribution, SEM, and content marketing, and Facebook ads, and a whole bunch of stuff. Austin Brawner: Yeah. It was a really good, more strategic episode about creative strategy. How to think about your ad spend as we move towards a time where a direct response, just conversion ads are becoming more expensive. How do we continue to look at a marketing budget and see a decreasing return on ad spend on channels like Facebook; how do you actually think about the impact of that and what do you do when that happens? If you're a business, spending north of a couple thousand dollars a month on Facebook, this is an episode that will be very very helpful for you. Andrew Foxwell: Absolutely. Let's go ahead and welcome Susan to the show. Susan Wenograd: Thank you for having me, guys. I'm excited to be here. Andrew Foxwell: Absolutely. Well, we've already given our guests just a little bit of background on you, but can you take a minute or so and kind of tell us where you're working, what's going on, and a little bit of an idea of your marketing expertise? Susan Wenograd: Yeah, sure. I'm currently an account group director at Aimclear, they're an integrated digital marketing agency. I spent probably a little more than half of my career since 2004, 2005 on the agency side. Then I've also had some stints where I worked in-house. I actually started in-house at Circuit City. 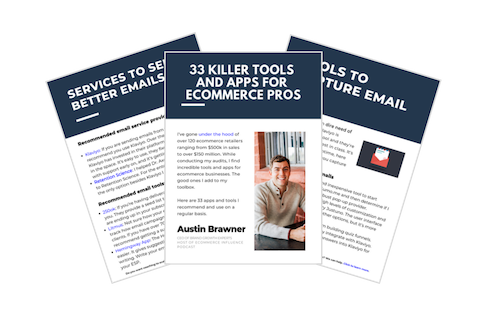 I was a copywriter, and then an editor, and then I got addicted to marketing, and all the things that we could measure, so I wound up moving over to the email marketing team. Then at some point, I ended up learning AdWords and then went on to learn a whole bunch of other paid media stuff. I've kind of done some content stuff, some email stuff, but the majority of my experience at this point has been housed in paid media. Andrew Foxwell: Fantastic, fantastic. Well, we're excited to have you on. You and I have been talking a lot about 2019 and what that means, and talking about a lot of things around attribution, and we'll get into that today. You're somebody that does a lot of speaking in industry. I guess one thing I wanted to ask right off the bat is what's the biggest message you want to get across to those that are ecommerce business owners or other agencies about strategy moving into this year? I'm curious about your take on that. Susan Wenograd: Yeah, I think it's been interesting to watch ... every year when I do my decks for speaking, it's always kind of fun to open up the one I did the year before and kind of see what the message was then, what people were asking about then, and usually I'll start to see some subtle shifts that drive what I wind up talking about the majority of the upcoming year. It just kind of becomes the stuff that people talk about more and more. I try and stay a little ahead. It's difficult obviously because things move so fast. I started to feel it last year, a lot of the talks that had gone for more of the tactical kind of, "How do I get Facebook ads to work for me," kind of thing, this past year kind of went into, "They're not working. What do I do?" That started to be more ... especially towards the second half of the year, and you know, I personally experienced that. got, and how much faster things are moving, and things that worked one week would just stop working the next week. It kind of felt like the heat really got turned up on paid social in the second half of the year. I think it started to beg larger questions about where it fits into marketing, because I think there's definitely the feeling that it contributes to marketing, but there's still that part of our DNA, that I think was really bred from the AdWords world of the first self-service platform that people really used was paid search. We got very conditioned to like, "I spent this much, this is what it drove." That was before there was mobile. It was just a desktop. Things were a lot simpler. There's still some of that mentality that I think people know that they have to get over, but the challenge is they don't know how to. That's not to say that I have the answer, because it's different for every client, but I think as we go into 2019 there's a greater awareness of ... we can't keep treating media, whether it's paid, or earned, or owned as completely separate silos. There's kind of this begrudging acceptance that they all work together. I think it's somewhat begrudging because people don't really know how to measure and value it yet. It's difficult to make that shift because there's not really any goalposts to say, "This thing is doing this thing when we pair it with this kind of content or this kind of channel." It's a lot of experimentation. I think heading into 2019, a lot of it is trying to get people to understand how you can measure some of those efforts, how you might want to experiment with it because I think it feels a little overwhelming. It's hard enough to learn some of these platforms without being like, "Now we've got to figure out when we spend money on content versus when we don't. When we push for an email sign up versus when we don't," because everybody's trying to maximize their media money. I think 2019 really is the first year I feel like we're going into it as more integrated digital marketers than we've had to in the past if that makes sense. Austin Brawner: That does make sense. You can also feel it just as a consumer when you start trying to make a purchase, or maybe you have the idea of wanting to make a purchase. Right now, I've been kind of looking for a pair of boots. I moved to a co-working space, it's like a 15-minute walk, so I started doing some searches, and then I started getting hit with Instagram ads for this boot company. I watched a video and checked it out, then went back, did some reviews, and my process was like Instagram to Google search to review, back to another deeper Google search, then seeing a retargeting ad, and you could just tell, we have so much more ability to bounce from channel to channel. How do you feel like paid media has moved or how is it moving from just being more of a direct return on ad spend environment to more of an integrated channel. You mentioned it a little bit, but how do people justify that to themselves and also to their bosses? Susan Wenograd: That's a great question and I don't know that everyone knows how to justify it just yet. That's part of the fun for us as marketers. I think it's part of a headache when you're in-house and you're having to kind of justify where you're spending and when, but you know, I think that there's this dawning awareness that we kind of moved away from a lot of the product education type stuff, and it really became about trying to sell as much as we could as fast we could. As we're getting so much information out there, the attention spans are getting less, so instead of it being, "Here's our 30 second video that explains pretty much everything someone would need to know to buy this product," now we're in the phase of, "They're going to watch like seven seconds, so if we're going to re-target to them on four of five other platforms, what're all those other things that we need to communicate that would've been communicated back when people watched 20 to 30 seconds worth of a message, if they're only watching five to seven seconds now?" It's forced us to take those overall marketing messages that used to feel pretty succinct and figure out how we have to slice and dice them into tiny little snack-sized pieces that people can remember, and then not only that, but then take them and make them the most effective they can be on each platform. As we know, none of the platforms behave the same. I mean, the videos that do well on YouTube, are not the ones that tend to do well on Facebook, etc., etc. You're having to create a lot of the little derivations of all this messaging that used to be a little more straight forward and simple. That's also lending itself to how we spread that money, right? on, easier to manage, things are getting sliced a lot thinner. It used to everyone just put all their money in AdWords. Then AdWords started to get expensive and there was that growing awareness of, "What about people that aren't searching yet?" Then we started putting money upper funnel into Facebook, and now Facebook's gotten expensive. There's an expectation management issue there, so then people are going to YouTube. You're starting to take those big budgets and slice them up smaller. At the same time that you're having to slice up those marketing messages even smaller. It requires this unprecedented level of coordination. You made a good point, as a consumer, it's always interesting to get exposed to that because you can kind of tell which brands have thought this through versus which of the ones that are still just trying to keep giving you the same messaging everywhere you go and hope that you eventually buy. I definitely notice it, because I'm an advertiser, but it's always kind of cool when you see a brand that has obviously put some thought into how they're targeting you with the videos, in what order you're seeing them, where you see them elsewhere on the web. It just takes so much more coordination than it used to, and some of that's coordination across departments too. That can be tough. I mean, there are departments that they have to kind of compete for budget. There's a little bit of healthy competition there a lot of times. There are a lot more pieces to take into consideration that there have been in the past, just between platforms, messaging, money, all of it's just getting sliced into smaller and smaller pieces. Andrew Foxwell: There's a whole bunch of stuff that's really interesting about what you just said. One of the things that I think is the most interesting is, hearing from someone that is like you, at a larger agency, it's a very well respected agency, saying, "You know, it's different for everybody." Susan Wenograd: It is. Everybody's like, "What's the answer?" I'm like, "Sorry, y'all. It's going to take some testing." Andrew Foxwell: In this industry, we hear things like, we'll see online, "Well, we have this video, here's the trick you need in Google Analytics to figure it out," right? "Here's the three tricks and tips to fully understand your funnel," right? Andrew Foxwell: I think that that is ... some of them are of course very helpful, right? Andrew Foxwell: Those are very helpful points, but it's not necessarily the most holistic approach, which is what we're talking about. Susan Wenograd: Yeah. It's the nuances that set apart the really good practitioners and agencies from just kind of the great unwashed masses. The ones that just turn out manager media spend and don't do anything interesting with it. That's where I usually see the divergence between the really great ones and just the average ones. Andrew Foxwell: Right. I would say too, your point about education is a really big deal of ... a good agency or a good in house person, or a good in house team, is going to spend, in my opinion, 50 percent of their executing, 50 percent of their time educating. Andrew Foxwell: Internally, basically. That's what Austin aims to do. That's what you aim to do, I aim to do. If you're looking for an agency, people that are listening to this right, one thing to make sure is that the agency is explaining things to you. There's an agency that I was working with a client on, they were spending ... their fees were about $20,000 a month. This client was spending a lot of money, okay? There was zero education of why they were doing what they were doing. Susan Wenograd: Yeah. I see that a lot. Andrew Foxwell: Until the client pulled this lever and said, "Hey, we're going to probably leave," then the CMO comes on and gives this like large huge email with a bunch of graphs and all this stuff. I was like, "Where was this months ago?" Susan Wenograd: Yeah. A lot of times when that happens, it's so much information at the end that you didn't take them on the journey, you know what I mean? It's like you're trying to distill War and Peace in one email. It doesn't work. By then, you've already kind of lost trust and there is also the factor to your point, where was this all along? Is this a convenient kind of scrambled justification for what's been done or was this actually a conversation that took place internally that drove what you guys decided to do? Andrew Foxwell: Right. Also, I think I agree on going through trying to distill it all. The thing that I think about a lot is the multi-touch attribution point, right, which is, for those of you who aren't sure, multi-touch attribution is essentially where I really think we're headed. This is the notion of what Austin just talked about, that there are multiple points that are going to drive revenue for us. It's going to be multiple points where people are going to become familiar with us, etc. A lot of the focus has been for a very very long time on, because of the foundation built on the last click from search engine marketing, right? That's where it's live. It's on, "Okay, where did they do this last?" You look in the Facebook attribution tool and there are things like positional attribution models. Look at time decay models, which are different ways to go about this. To be honest, I'm learning about this, I've thought about it a lot, read a lot about it, but I feel like I need to be a data scientist to fully understand it. Andrew Foxwell: How do you talk about multi-touch attribution to your clients? How do you start to help them understand, "Here's what we're going to do. We're going to split the media spend this way." For a lot of ecommerce business owners, it's going to be things like Facebook, Instagram, email's going to be a huge one. Some people will maybe be doing chatbots or something. How do you start to split that and talk about multi-touch attribution and say, "Here's how we're going to start to measure this." I'm curious about your answer on that. Susan Wenograd: Yeah. Some of my ... my favorite, every paid marketer's favorite answer is, "It depends," but some clients already have that worked out. Usually, the bigger more sophisticated ones tend to have an idea of how they approach that. Flawed though it may be, I think some of them have kind of realized that every model is going to have its drawbacks, and there's probably going to be things that aren't accounted for, but overall, given what they know about their marketing cycle, this is the model they follow. Some of them will create custom models in analytics that we upload and apply those when we do our reporting. For other ones that don't have that, a lot of times I start the conversation with understanding typically what their selling cycle looks like. A lot of times that'll be things like looking at the time lag path in analytics, just getting an idea of how long does it seem to take people to decide whether or not they want to buy. I usually start with the length of time piece of it. You usually see some correlations between price tag, so when it's more expensive, people tend to research more before they plunk down the money. There's also just the education piece of how long does it take to understand what they're selling. For some ecommerce products, it's pretty easy to understand. It's self-explanatory. There might be some hangups around the price. Then other times you might see, there might be hangups around price and education. Understanding which of those things add to that timeline helps us know what to address on the front end and with our creative, and with the things we run later. It gives us a sense of ... it typically takes someone 30 to 45 days to buy this, so if we know that going in as you said before about the educational piece, it helps us have that conversation with the client of, "In the past, you may have approached media as, 'I spent five dollars and we earned 20,' but given that it takes this long for people to buy, that timeframe needs to be looked at over a longer period of time." Sometimes it's just helping clients look at their data a little differently to understand what that means when it comes to their marketing efforts. A lot of times they'll know it takes them this long, this our AOV. They know their numbers cold, but they don't necessarily know how to take that and start applying it to their marketing plan. That's usually where I'll start, is just to get an idea of what they're selling, what the hiccups might be, and that actually is a useful exercise to have for later when we start doing things like creative and targeting as well. Austin Brawner: You mentioned, as you kind of went into this, that every different model that people use has downsides and upsides. Do you have any examples of common models that you see for people spending a bit more and what may be the upside and downside of those models look like? Susan Wenograd: Yeah. A lot of times for the larger ecom clients, I tend to see a lot of time decay go on. I've seen them use time decay and apply it in a way where the timing that they're looking at might not really align with how people buy. Kind of the previous example, if it takes someone 45 days and they're using time decay, and we know based on user behavior they might visit their initial touches once, and then their next touch isn't until two weeks later, and then they visit four more times and convert. How much they apply to that first touch, sometimes it might be one of those things where you don't even want to count it as relevant. That's kind of the same thing you run into with the more linear paths, where they give equal credit to each channel. It doesn't necessarily account for things like it's counting its three-second view of a Facebook video that someone clicked and they spent two seconds on the site. There are some user behavior things that I think tend to make some of those models a drawback, because it's not necessarily accounting for quality, it's accounting for quantity. I mean, you can do some more customized stuff that'll filter all that out, but just in the basic ones, I see people use, there are some consumer behavior and quality of traffic piece that doesn't necessarily make it into that equation. Andrew Foxwell: Time decay, can you just explain that really briefly for everybody what that is. Susan Wenograd: The time decay model basically says the further back the touch was, the less credit we're willing to give it. If someone was initially touched, they came from a Facebook visit 30 days ago. Then they visited four more times from other channels, as they got closer to purchase, they value those waits closer to purchase, which of course also can create the issue of, "Well, of course, they're going to convert more on search, because at that point that has intent." When we talk about those drawbacks, those are the kind of things in each model, when you consider how it's actually probably being used by the consumer; they all kind of have their pluses and minuses. Andrew Foxwell: One thing you talked about too, in the past, is using SEM and keywords to increase the click through rate of Facebook ads. How do you, if people are maybe even not spending on search engine marketing, but they want to, or they want to use it for research to use in Facebook, how do you bring these things together? Can you kind of talk about that one little trick, that you talked about? Susan Wenograd: The cross channel stuff is like my favorite, cause there are so many ways to do it, but one of the things that we've done a lot that we've seen better results from on creative; especially when you're running retargeting on platforms outside of search, is when you run on the AdWords side, we will make sure that we tag everything, so that we know keyword that the person came in on. Assuming you're spending enough so that your pulls are nice and large when you run on ... you're retargeting on the Facebook side, instead of just running to people that visited the site, we'll actually get more granular and say, "You know, they came by search through this keyword and based on the keyword they were matched to, those are the keywords that we will try to use in the headline. If we have the opportunity to integrate them in the video, we'll do that as well," so we're carrying through their initial research behavior in the terms that they associated with the brand that we're advertising for. We'll carry that into other platforms to keep reinforcing that message. Austin Brawner: You chatted a little bit about the size. You said assuming they have a large enough audience. If you were to kind of break down the size of ad spend for some of these types, specifically that example, right? That's a really really good example of a larger business. How large do they have to be to be able to be thinking about that type of a pairing between SEM keywords, and Facebook, and if they're not there, what are some other things that they might be able to do to kind of ... I don't know ... get kind of a ... if they don't have the audience, what else can they do to kind of help them? Susan Wenograd: Yeah, no. That's a great question. You can definitely do that tactic at a higher level if you have a smaller budget. It's usually not so much about how much they're spending, but a lot of times it'll be about how much are they kind of dividing that budget among a bunch of different keywords. Let's go with an example. Let's say someone's spending $5,000 a month on search, for example. If they're taking that, and if they sell a lot of products, so that amount is divided among a hundred different keywords that aren't very tightly related, that's going to be difficult to make your marketing pulls from, because you're taking your audience and you're dividing into such little tiny pieces, that obviously you're not going to necessarily hit the cookie pull side on Facebook. If it's something where you're running groups of keywords, there might be a hundred of them, but if in general, you can divide them into three or four overall themes, for example. You can group them at a higher level together like that. You might say ... let's say you sell, I don't know, car wax, for example. You might have keywords that are related to car wax, keywords that are related to polish. If you can come up with those large silos of keywords, you can group the ones that make the most sense that is kind of interchangeable. Sometimes what we'll do on smaller builds like that is, we will create the remarketing groups in Facebook but include more than just one term. As long as they're kind of tightly wound together. Then we'll try and use the keywords that we bounce together throughout the copy, so each one is kind of hit on. You can combine that stuff to make it larger pulls if you need to. It doesn't necessarily need to be overly granular. Andrew Foxwell: I like that a lot. I think it's really interesting. One other thing that you mentioned that's not on SEM, but is another point that you made in your article that was recently in Marketing Land, is utilizing brand awareness or reach buying on Facebook, or really another place, but mostly you were talking about in the reference of paid social to complement maybe some of your mid to lower funnel actions, which is something that I've done. Tactically this would be just basically not just fully depending only on the conversion objective. The conversion auction, right? This would be operating on the reach auction and/or brand awareness. Can you talk a little bit about that strategy and why that's important or why you'd want to integrate some more brand buying in the mid to lower part of the funnel? Susan Wenograd: Yeah, yeah. That's another topic I love. One of the things and this is definitely something that Aimclear feels passionately about, as do I, is at the end of the day, no matter what product you're selling, you're creating a brand. If you're in it to just kind of sell products quickly and not really have any longevity, that's where you see a lot of companies get eaten alive. They have a really hard time when algorithms and things change. Andrew Foxwell: And drop shipping. Sorry, sorry. Excuse me, sorry. Susan Wenograd: They'll remain nameless, but yes. It kind of cranks out a quick win, then 50 other people get knockoff products and that's the end of that. If you're in it for the long haul and you're building a brand, when you look at something like a brand search, and this is kind of where the multichannel piece comes in, but when you look at the cost of bidding on your own brand name in AdWords, it's pennies. It's nothing. The conversion's crazy high, right? It's very cheap to do. It's getting harder and harder on AdWords to compete on those high intent words, where you're just going to crank out that quick sale because you're kind of eroding the brand and people are really price shopping. One of the basics of marketing is that you want to create a brand. It's difficult in the direct response society that we now live in and digital marketing because it's the long game. It's not the short game. The idea is that if you can't necessarily compete and or you know that you're in it for a long term win, where you want to have repeat loyalty and you're looking at that media buy as you investing in future customers, and not just the sale you're making that day; one of the things we've started to do with clients, and it's super interesting. I totally geek out over it. I love it. We started integrating, you know, we'll kind of have the basics of, "Yes, we want to have a certain amount of conversions. We need to have a certain amount of return on spend," but there has to be that piece of the long game of, if something changes in the search, if Google changes something and organic drops. We need to make sure there is attention being paid to the brand that we're building. The messaging, the feel of it, what people identify and associate with it. Social is still a great place to do that because social still is very cheap for the non-conversion media opportunities that are out there. One of the things that we have been doing a lot the last year and heading into this year is, designating a piece of the media spend to go towards branded experiences on Facebook. Ideally, they click through to the site, but if they don't we'll take it as a remarketing audience either way. Creating experiences where people interact with the brand, identify the brand and measuring that on the analytics side in the form of increased traffic from direct and organic behavior. Ideally, we like to have people click through on the ad. We bucket them in analytics. We can see what they do over time. We'll pull them into an audience on the search site, we'll bid on them differently, but it gives us more longevity to see what that spend does for us, because there's no denying a lot of the clients I worked with that were very direct response focused, they would be like, "Well, Facebook's not working, because it's not giving us the return on spend we need. We want to turn it off." Inevitably, when we would turn it off, they would see a decline in direct traffic and they would see a decline in brand. We didn't necessarily have any way to quantify it at the time, because we just weren't measuring it, but it was something that we've actually created a discipline around. We've started doing things like, based on what we've seen for the last x months and last year, here's what we forecast this traffic to look like, and here's what it's doing in the cities where we're doing pocket and pilot testing of running these branded videos. It kind of gives you that long review of when we spend this money, how is it impacting those multi-touch points that tend to get credit for the sales, but we know that they learned about them from someplace else first. Andrew Foxwell: Yeah, it's interesting, I think one thing that you could push too, right, and maybe what you're doing is talking about utilizing instant experiences via Facebook and Instagram, where it's a more multimedia push onto the newsfeed. Great for brand buying, doesn't have to be as through the cost of a conversion campaign. It can be simply like, "Who's who we are. Here's what we do. Here's what the mission is." It doesn't have to be exhaustive. It could be some sort of customer testimonial. We did that with a couple of brands last year and I think we really need to push more of in 2019 is utilizing ... we had like a chatbot flow set up to collect user-generated content of reviews and then we gave them a huge discount code. We used those in instant experiences to people that had engaged on Facebook or Instagram or had visited in the last 30 days, but hadn't been back. It was like trying to bring them back in was something like, "Hey, here's what's great about what this is." Engaging them in something interesting. It looks more real as well. Susan Wenograd: That's the other thing that's kind of interesting that we see is, when we focus more on kind of the general brand messaging or "Hey, here's what we do," and not pushing the sale, it seems like ... and this is kind of anecdotal, it's not something I've necessarily measure, but ... the interactions seem to happen more naturally on the ads. You tend to get a lot of the customer service stuff on the selling ones where people are like, "I bought this and it took two weeks to get here." On the branding stuff, we tend to see people tag people they know a lot more. They tend to share it a little bit more because it feels more organic to the platform. It doesn't feel like an ad. It doesn't feel quite so much like a selling message. It's interesting too, because that also creates further remarketing audiences for you, because then you not only have, if it's a video, you have people that watch the video, but then you have people that are engaging with your ads as well. It kind of takes that cheaper CPM and it sets you up for more future success versus trying to go for those $30 CPM's right for the conversion. Austin Brawner: When you're trying to break this down, because I totally agree when you hear businesses talk about a channel stopping or not working anymore, Facebook for example, often you'll get this gut reaction where they're like, "Well, we need to turn it off. We can no longer do it profitably." There isn't really a plan to move that marketing spend to somewhere else. Just shutting off Facebook, say you're spending five grand a month, you're just shutting it off, isn't generally the right answer. It's never the right answer. It's trying to figure out what to do with that marketing spend. This last year, I've been talking a lot about developing a marketing budget and then maintaining that budget, regardless of how it's performing. You're just shifting it around and moving it around. For somebody in that position right now, where they're feeling like, "Okay, we're getting squeezed this year," where can they reliably shift some of that spend? Is it towards content marketing? What are the things that you feel like they can reliably shift some of their spends over to this upcoming year? I really like the idea of testing how much direct and brand traffic is influenced by the top of the funnel. Where are you directing people to put that marketing spend this year? Susan Wenograd: I apologize by the way if you guys hear background noise. My dog decided to get up and he's sneezing and walking around, so if you hear any weird animal noises behind me, it's my dog. I don't know that it's necessarily moving to different platforms. I think a lot of what I'm seeing is rearranging expectations about what these platforms are going to do for us. We'll stick with the Facebook example. To your point, people were dumping money into Facebook, and they're like, "Wow, we're getting a seven x on spend." Now it's down to like two. A lot of those same people have redeployed that money, to your point, more to top of the funnel. I still see Facebook do well for top of funnel but so much of it is just about managing the expectations. Still, in some instances, people get the kind of results that they get off of search, where some people get even better return off of Facebook, which is great for them. It's not the majority of what I see anymore, but the brands that have understood that there's still value there, but it just needs to be mined differently. Mostly it's about the long term of how long it takes to accomplish the sales that they were used to getting quickly. The expectation management around the fact that there are a lot more advertisers, there's a lot more messaging. Hang on one second. My dog is going crazy on his bone. Hang on. Alright, alright. There's this expectation management that has to occur around, even though these platforms don't do what they used to do well, it doesn't mean they're not good for other things. I think that's sometimes the hardest part to get over is that people just want to keep making those conversion campaigns work. If they're not, having the courage to say ... sometimes it almost feels more comfortable to be like, "We're just going to pull the cost," like you said, because they feel like they're making a definitive choice, that this isn't profitable, so we're not going to spend the money. When in reality, even though it might feel a little scarier, what you may want to do is take that money and redeploy towards building remarketing audiences of yourself, instead of trying to go after that audience. We still see things ... video views are a little tougher than they used to be, but we still see engagement work well. We see some video views work well and kind of using those different ad experiences that there are; like Andrew had mentioned before so that it looks different than what people are used to seeing in their feed is also really helpful. I totally agree with you. I don't think it's about moving to other platforms necessarily. I do think that other platforms are going to grow in prominence, so Pinterest finally, finally got a CMO, which I'm hoping means they will create an ad platform that I don't want to curse at every time I have to log into it. I think that there are other platforms that are poised to do certain niche things better. I don't know that they're there yet. I think that some of them will outperform Facebook in the future for some of the things that they do. I think people's expectations around what paid social's going to do for them needs to be realistic with what the platform is capable of, and a lot of that has to do with the competitive landscape. Andrew Foxwell: I agree. I think expectation setting's a big one. I think to Austin's point too, you know, Austin and I have talked a lot on this podcast about influence on marketing, which is I always tell people, "Look, if you're willing to talk through the double swinging saloon doors into the wild west of influencer marketing, welcome." You can. Even the services that are out there, I just don't feel that they help as much. I think that's another place you can shift. I think Pinterest is another place you can shift, but that requires its own set of work too, right? That's a whole other thing. The final question I have, I guess revolves around content marketing. A lot of bigger brands, content marketing is a huge part of it. Even e-commerce brands, I get asked often, I know Austin does too, "Where does content fit in my funnel? What do I do with it?" My tactical answer tends to be, "You can use it the top of funnel or in the middle of the funnel." Let's say the ad is interesting enough that people click and then you can remarket it to them to say like, "Here's what we're about," or "The top 10 reasons we're different than this other brand," or something like that. I think that the idea of using business insider articles or Forbes articles as your top of the funnel is declining in efficiency. How do you feel about the state of content marketing generally right now? Because I mean, HubSpot, which is an inbound marketing agency, they're now saying they're going to advertise on Facebook. Where do you see that fitting for e-commerce companies? Would you encourage people to create content? If so, where and what type of content is it, or is it based off of queries, or I don't know ... I'm just curious. Susan Wenograd: It's a great a question. For me, it's interesting to watch the content marketing thing, because I'm not on the SEO side. I'm a spectator, I'm not participating in. I'm very happy to see that I feel like we're getting away from the, "Just create content, because it's really important," which I feel like has been going on for the past three years. I'm like, "Oh my god, stop writing." Less is more. Quality, not quantity. I think for me on the selling side, where I see the most value is, you mentioned briefly, but the customers that pay attention to the queries that people are making. This kind of ties into the SEM strategy that we talked about as well, where we see people searching informational queries and coming to the site, that also provides a wonderful time to retarget them with information that's going to be relevant. If we know that they searched, I don't know ... iPhone versus Samsung Galaxy, or whatever it might be, if we know what their query is, we know what information they came looking for. If we can offer up anything afterward that's going to reinforce that or redirect them towards more things that reinforce us as the brand, or why they should buy us over another based on those queries, that's where I see content marketing playing a pretty large role. I think it's very tough to try and create content for the top of the funnel without looking at any of that because whenever I see companies do that, they spend all this time and resources putting all this behind content ... that they could show it to users and no one cares. A lot of times what the users care about are not the things that the company has learned to market itself on. They just have a mind of their own, right? It's a really important glimpse into customer psychology. I think with search, it kind of feels almost like a commodity now, especially paid search. It's been around for so long and it's a mature platform, but I feel like what people aren't using effectively right now, is the psychology behind that, to inform these other channels that they're running. It would save so much time and effort if you know x number of people are searching for this and coming to the site looking for information. If you're going to retarget to them, retarget in that lane. You know what I mean? You know what they are about, so don't start selling them on a bunch of other features when they clearly already told you that they were researching this particular thing. I think it really has a strong place in the middle and bottom of the funnel. A lot of that, I really feel like is on the search marketers to be communicating with the content people. I usually see a disconnect there sometimes, because sometimes it's like the comms team or the PR team is creating all of that content and nary do the two meet. They never talk to the SEO people. It's considered like a different discipline. It feels like to me when I deal with clients that have those departments, there are still some walls that need to be broken down there. I think once they can nail that really well, it will provide us paid marketers really great fodder for some of that follow up retargeting that isn't selling focus but is helpful and informational. Austin Brawner: Susan, this has been awesome. I really have appreciated you kind of breaking it down and giving us some more insight into what you feel like is coming up this year. Susan Wenograd: I hope I'm right. Austin Brawner: It has been a confusing time. Susan Wenograd: Let's see. Again, they're all just predictions. It's like, "What the hell do I know?" After watching it for this many years, this is kind of how it feels in my gut. Austin Brawner: No question. Also, having some experience being around for some time in this industry, you kind of get a feeling that ... it's not freak out all the time when things changes. It's just things evolve and that's the way it works. I really appreciate your insight there. If somebody's been listening and you'd like to direct them to a place to connect with you, what would be the best place for them to find you? Susan Wenograd: I tend to be on Twitter, like all of the time. You can follow me there. It's susanedub, D-U-B. I'm on there pretty all the time, so feel free to shout with questions. You can DM me and I'll actually respond. That's usually where I spend most of my time. Andrew Foxwell: Awesome. Thank you very much, Susan. Austin Brawner: Thanks so much. Susan Wenograd: Thank you, guys. This was a blast.